Every December 10th International Human Rights Day marks the milestone document created by the United Nations General Assembly in 1948. This document, available in over 500 languages recognizes that every human, regardless of age, race, gender, religion, language, political or other opinion, national or social origin, property, birth or other status is entitled to certain rights as a human being. 2018 marks the 70th anniversary of this important document. Let’s all stand up for our own rights and the rights of all people—everywhere. What do you notice about these pictures of us that are the same? What do you notice that is different? Explain that people come in all shapes and sizes. They may have different skin colour, different customs or religions, different homes, and different clothing. The one thing everyone has in common is that they are people, in their case, children. Have students select a piece of construction paper (they can choose the colour) and outline their hand. On the hand outline, ask them to print their first name and age. Then, use the hands and the pictures students drew earlier to create an unbroken “Chain of Children” on the hallway walls. Post their pictures linked by the hand outlines. Tell the children that as they enter the school every day they will be reminded that all people are important, valued, respected, and appreciated. Encourage the students to help a friend, share a new game or toy, make someone new to the school feel welcome, invite everyone to play with you outside- and most important- smile!- It is the easiest way to make someone feel appreciated. 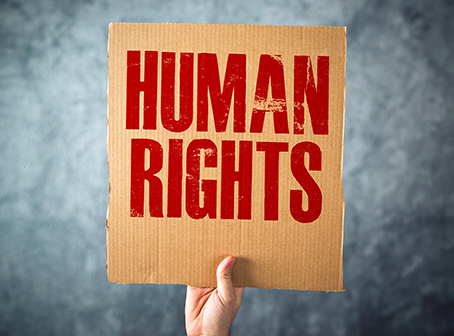 What do you think the words “human rights” mean? What do you think children need in order to survive? Do you think all children, everywhere, have these things? Discuss. Briefly explain what the United Nations Human Rights Day is about (see introduction). They had no electricity or running water in their home. They were not allowed to go to school because their family couldn’t afford it. They were always hungry, cold and wet. People in their village were really sick and there was no medicine. Explain that as Canadians, we are very lucky. We have access to food, shelter, education, and health care. Remind the students that many communities in the world do not have these basic rights met. Tell the students that even though most of us have what we need to survive, there are still many ways that we can help make a difference in the lives of others. Form small groups and provide chart paper and markers. Have each group brainstorm small ways that they can help to ensure that everyone in their class, school, and community feels respected, appreciated, and cared for. * Note: You may have to provide a couple of examples: share markers, scissors etc., intervene in a bullying situation, stand up for a friend etc. Share the posters and ask the students to be part of a “Kindness Crew” to help all children feel equally important, cared for, and respected —not just on Human Rights Day, but every day! Why do you think this declaration was created? How well do you feel that the general public know and understand the importance of this declaration? Discuss. What is the difference between a “right” and a “privilege?” Share some examples. As a Canadian citizen, and a student in this community, this school, this classroom, what can you do to help promote equal rights for all? Discuss. Be respected when expressing their views and opinions. Explain that their task is to work alone, with a partner or in small groups to make posters that promote small ways in which the students in your school can honour the Universal Declaration of Human Rights.